Visual Studio Code>Programming Languages>BefungeNew to Visual Studio Code? Get it now. 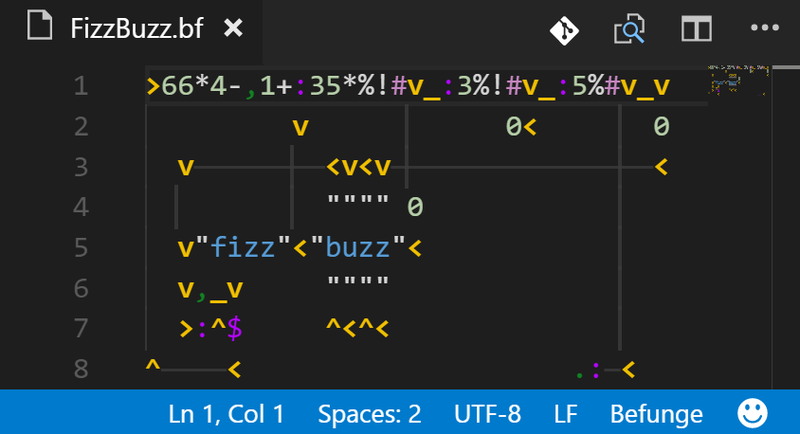 Implements Syntax Highlighting in VS Code for Befunge-93 and Befunge-98 programming languages. Adds alignment guides coming from the directional characters (>, v, <, ^, ?). Associates .bf, .befunge, and .b93 files with Befunge-93, and .b98 files with Befunge-98. Open VS Code, select the extensions icon (Windows: ctrl + shift + X, Mac: cmd + shift + X) and search for befunge. Or maybe you are already here in VS Code. Nice! Add "befunge.guides.enable": true" to your Workspace or User Settings if you want to enable Befunge alignment guides. "befunge.guides.enabled" true (boolean) Enable the Befunge guides coming from arrow characters. "befunge.guides.color.dark" "#3c3c3c" (#rrggbb hex string) The Befunge guide line color to use for a dark theme. "befunge.guides.color.light" "#dcdcdc" (#rrggbb hex string) The Befunge guide line color to use for a light theme. As VS Code does not (yet?) allow themes to be set on a per language basis, this adds to your global theme. However, all scopes used in this blurb end in .befunge, ie, this should not affect your theme anywhere except on Befunge files. Of course, feel free to modify this to your liking, and look at the scopes contained in the *.tmLanguage.json files to see what other Befunge scopes you can customize the theme for. Currently no known issues for this extension. Find an issue/bug? Report it! Update npm dependencies addressing (another) low priority npm vulnerability alert.